The Good Times Blog: Iranian Presidents In New York, Ninjas Robbing Gas Stations in Pennsylvania, What is This Country Coming to? Iranian Presidents In New York, Ninjas Robbing Gas Stations in Pennsylvania, What is This Country Coming to? I was going to write an awesome post about Mahmoud Ahmadinejad and how he is crazy like a fox. My post was going to be based on this "just the tip of the crazy iceberg" quote from his speech at Columbia University yesterday: "In Iran we don't have homosexuals like in your country. In Iran we do not have this phenomenon. I do not know who has told you we have it." Then I realized that the GTB is dedicated to investigatory journalism and Mahmoud Ahmadinejad being crazy is not a hardhitting news report. In fact, it isn't news at all and you and I both know that stories that aren't news, aren't what you come here for. So I went in search of a story that IS news. That IS crazy. That is exactly the type of story that will shock and inspire our readers. That's when I stumbled upon this story about the gas station in Richland Township, PA that was robbed early Sunday morning by women dressed as ninjas brandishing a samurai sword and a dagger. The bandits made off with lotto tickets and a bag of cigarettes (classy!). The suspects are still at large. 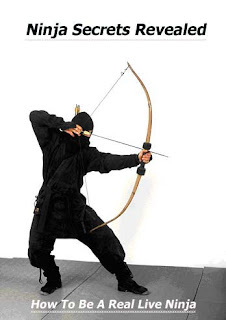 I also suggest you check out this site that tells you how you too can become a ninja. Hopefully not the kind that robs gas stations for smokes and lotto tickets you can never cash in. Does Victory Taste Good Roy Pearson?